Tired of Complex, Frustrating Contact Management Software? Ready for Something Amazingly smart & easy! Easily Keep Track of Everyone! Designed with an intuitive interface that makes it easy to find your contact information quickly and easily in seconds! Create unlimited Categories to Group your contacts to make finding things easy. 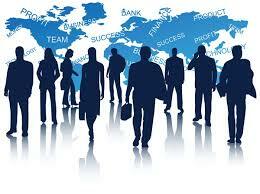 Create Groups for your friends, family, business associates or anything. One click on a group displays every record you have assigned to it. Each contact record can belong to multiple Groups. Contact Wolf is easily configured for sharing the database on any network. We even added a menu option in the software that lets you quickly setup your computer to access the shared database. 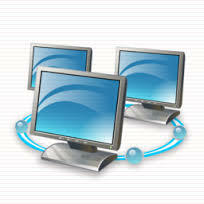 All of Contact Wolf's great features are also designed to work in a network environment. Simply set your UserID and then only you will see your personal reminders, contact log entries, To-Do List, etc. Everyone that's sharing the database can see and edit the contact records but only your eyes will see your personal items. Password protection options are included if you want to also hide records from other users. Set a reminder so you don't forget to call someone in your address book or for meetings, appointments, etc. The Reminders can be configured to automatically reset daily, weekly, monthly, yearly. 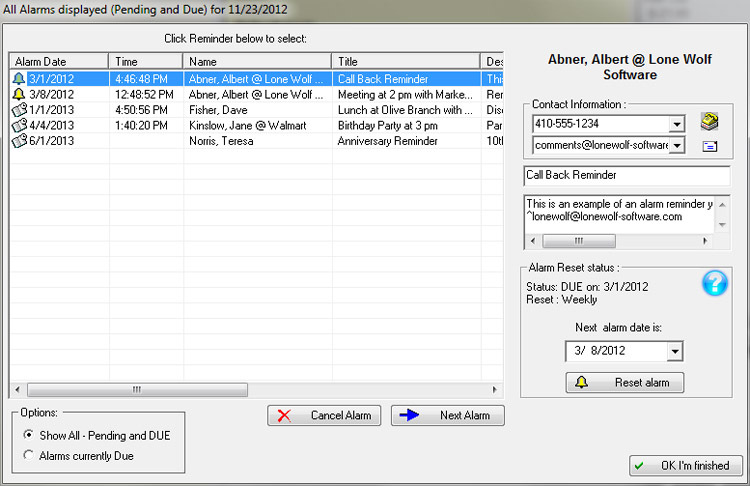 An Alarm Monitor allows you to set a reminder to display at a specific TIME and can automatically send an email reminder even if Contact Wolf is closed on your Desktop. Easily link any type of file or document (images,.pdf's,Word,Access,etc) to any record. Viewing or editing a linked document takes just one click! Our Address Book Software supports most Avery labels. Select your Label size from hundreds of standard Avery labels. 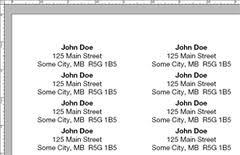 Choose the Label format and the addresses will be automatically aligned and ready to print. The PRO version allows you to design your own custom labels. The starting row and column can be specified so you never waste any labels on your label sheet. Finding contacts is easy! Locate records using the alphabet Tabs (A-Z), click on a Group you've created to list the contacts assigned to it or use the built-in flexible Search engine. Contact Wolf's Search & Find options let you find exactly the data you are looking for. You can control which data fields are searched and Link multiple keywords with a plus sign "+" to only find matches that satisfy your targeted search criteria. Multiple Personal and Business Reports are included that automatically format your contact data into perfectly rendered reports. Each Report can be exported into multiple formats (pdf, Excel, CSV, Lotus, Rich Text, Word docs, XML and more) See a few examples below:. Saves a detailed and dated contact history for any contact record. One click displays it's complete contact history. We have thousands of satisfied customers using our address book software every day. It will make managing your contact information effortless! Need Help deciding which version to purchase? "Guys, you are magic. I bought your contact software and have been really pleased with it. It does all that I want it to (and more) but the best thing is that I can interface with my USB modem to use Windows to dial from my VOIP direct to the phone. Great stuff and miles ahead of the others. Not only that, I upgrade my hardware and you, very courteously, provide me with new activation codes. This is above and beyond what I expected (especially after having to pay 'upgrade fees' for other programmes). Just saying that you are great and deserve to be recognised. Not sure how I recognise you but this is my attempt. Circulate this as you will and if you need recommends then send them my way! "I truly love this address book – this is my second copy. The first purchase was made well over a year ago so I repurchased because I did not feel it fair not to do so when I am putting it on a new computer. Also, for the many times I use it, it is worth far more than all the other address books available today. It is really a very good product and as I said the very first time I wrote, a year ago, I wish you could lend your programming skills to Photoshop’s Adobe people, so they might learn how to write easy yet effective programs for those of us lacking a computer science degree. Thank you again,"
"I purchased it for my wife to run her home based small business and she absolutely loves it!" "I just downloaded the new version with the Birthday reminders and its awesome! Thanks for a great addition to an already great product." "Superb design and easy to learn. I use it at home and to run my business. 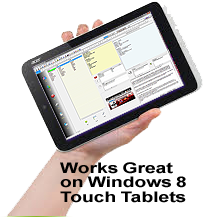 The best contact manager software I've ever used." "My only question is why can't all software be this good!" 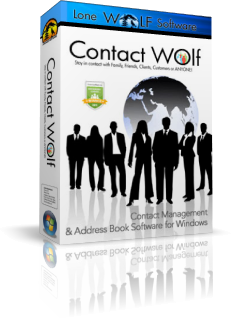 "I have found Contact Wolf a great deal more user friendly than any other I have including Office and Corel. I love it as I can include all the information that I want. The best I have ever used." "This Contact Wolf program is a keeper. I run my business with it. Fast and efficient." "I think I will thoroughly enjoy using this program especially with the free upgrades policy and the outstanding support given even before I purchased the product. I finally found an Address Book Software program that meets my expectations!" A great little To-Do List that will just make life a little easier!